Robert deMaine is an American virtuoso cellist who has been hailed by The New York Times as “an artist who makes one hang on every note.” He has distinguished himself as one of the finest and most versatile instrumentalists of his generation, performing to critical acclaim as soloist, recitalist, orchestral principal, recording artist, and chamber musician. In 2012 he was invited to join the Los Angeles Philharmonic as Principal Cello. DeMaine is the cellist of the highly acclaimed Ehnes String Quartet as well as the newly formed Dicterow-deMaine-Biegel Trio. A first-prize winner in many national and international competitions, deMaine was the first cellist ever to win the grand prize at San Francisco’s Irving M. Klein International Competition for Strings. 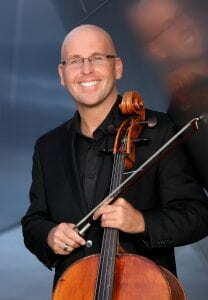 As soloist, he has collaborated with many distinguished conductors, including Neeme Järvi, Peter Oundjian, Joseph Silverstein, and Leonard Slatkin, and has performed nearly all the major cello concertos with the Detroit Symphony Orchestra, where he served as principal cello for over a decade. DeMaine has also served as a guest principal cello of the Saint Paul Chamber Orchestra, the Toronto Symphony, and the Bergen Philharmonic in Norway. Robert deMaine has recorded for Naxos, Chandos, Dorian/Sono Luminus, Onyx, CBC, Elysium, and Capstone, and has been featured on the BBC, PBS, NPR’s Performance Today, the Canadian Broadcasting Company, France Musique, and RAI, among others. His recording of the John Williams Cello Concerto (Detroit Symphony, Leonard Slatkin conducting) will be released by Naxos in fall 2015. DeMaine studied at The Juilliard School, the Eastman School of Music, the University of Southern California, Yale University, and the Kronberg Academy in Germany. He is represented as a solo artist by McAlister Arts LLC.